If you love nature, enjoy active holidays, and believe that we need to change things on our planet because we are destroying, it our Eco Experience programme is right for you. Eco Caminhos is situated in Cardinot a beautiful rural neighbourhood in the mountains. The green mountains, the waterfalls, creeks, variety of birds, and cows grazing on the steep hills give you the feeling of absolute freedom. We offer you the opportunity to live with local Brazilians in this wonderful environment, experiencing their culture, customs, and food; the ideal setting to learn and practise the Portuguese Language. The host families live right next door to Eco Caminhos, where we offer you the possibility to participate in bioconstruction, organic farming, and a number of ecotourism activities including Portuguese classes, hikes, campfires, and visits to touristic sites. 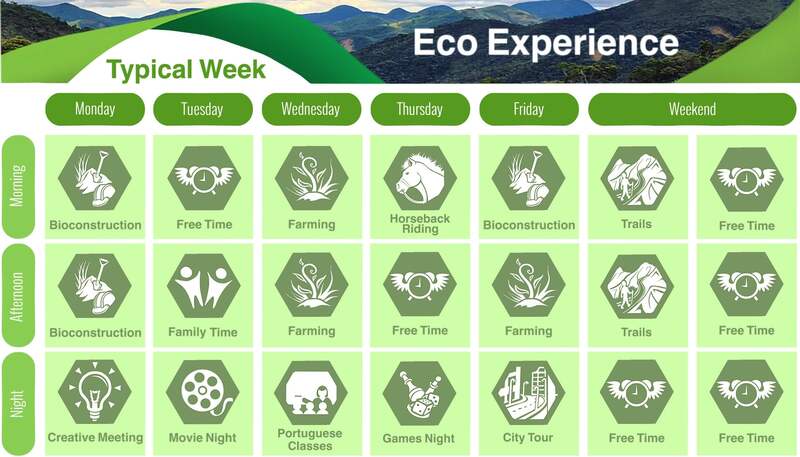 Volunteers in our Eco Experience programme usually choose to work approximately 24 hours 3 days a week. Volunteers can choose between bioconstruction and organic farming. Our project coordinators will provide you with a theoretical introduction to the different techniques we use. After this you can join the ongoing projects. Our activity coordinator will organise one special activity per week for you. This varies from hikes, camping in the mountains, horseback riding, to cultural trips in the region. In addition, you are welcome to the volunteer nights at Eco Caminhos, which include movie nights, board games, and campfires. Of course, you are also free to make your own plans. After your work day and on weekends when we do not have any activities planned, you can do as you please. Many of our volunteers use their weekends to explore Nova Friburgo or Rio de Janeiro. Eco Caminhos carefully selected families in Cardinot near our Eco Farm. You will have a private room and will be offered full board. Only when the family is not home you are expected to cook your own food. The local Brazilian families are very welcoming and friendly, and they enjoy letting you experience their local food and customs. So far we have had nothing but great feedback on the programme. To guarantee your safe and comfortable arrival our trusted driver from Nova Friburgo, Patrique, can pick you up and leave you at the Eco Caminhos doorstep. He will wait for you in the arrival hall with a small name plate. Patrique charges only R$ 400 (approx 100 Euros), which is a very sharp price for Brazil. We can also arrange for you to be dropped off at a specific location on your day of departure. full board: delicious typical local Brazilian dishes.